Megan and Erik's wedding day is one of the most creative and colorful weddings I've ever seen. With a wedding dream team including Photography by Betty Elaine and styling and design by Hello Productions, just one look and I think you'll see that this wedding is full of the good stuff. Megan and Erik met in law school, and as fate would have it, they were the only two coffee drinkers during their internship. And well, before they knew it, these two coffee lovers were falling in love themselves. He popped the question, she said yes, and a wedding there would be! From the photographer, "Their wedding day was a rainy morning that we weren’t quite sure if it was going to clear up. Therefore, we had to think creative and we ended up moving their first look location onto the trolley. And it was such a perfect moment! They could not stop laughing and smiling." Some other highlights from their day? "Bridal portraits in North Shore were a dream. Randy Land was so colorful and unique! Not to mention the amazing florals that Floral Designer greenSinner put together for both the bouquets and the centerpieces." Megan and Erik danced to “I Will Follow You into the Dark” by Death Cab for Cutie for their first dance as husband and wife. Some other memorable moments for the couple include the Calvin and Hobbes quote during the ceremony, a pie dessert table at the reception, and one of the best dance parties of the year thanks to the band Radio Tokyo (truly fantastic). 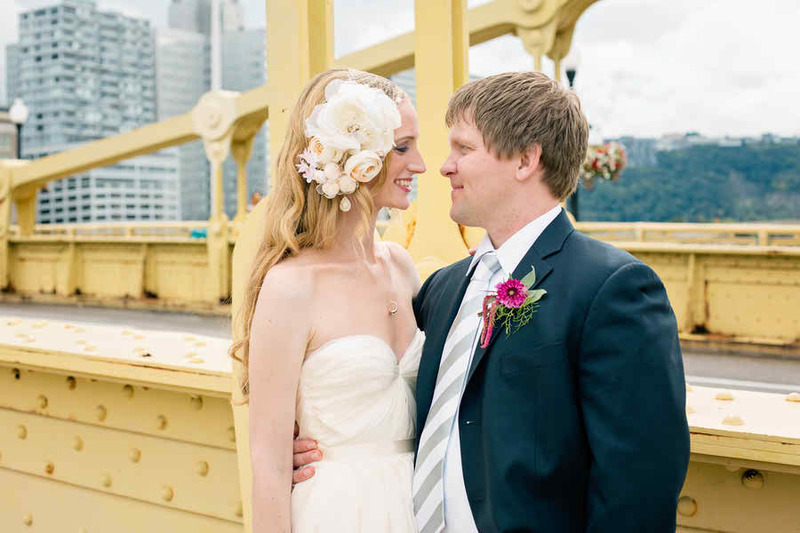 12 Comments " Loft Wedding in Pittsburgh | Megan and Erik "
Love the feathers in the bouquet! Totally In love with the bride`s flower tiara. Just gorgeous! Such a fabulous array of colors! Love her bouquet the colors are so vibrant! So much fun! The colors and overall style are so much fun to see. Beautiful flowers, of course! Absolutely love her dress and colors! Gorgeous bouquet and I adore the bride's hair. Just stunning! Wow, those bouquets are stunning! Absolutely stunning color palate! As a florist, I love seeing the result when brides pick flowers that pop against the rest of her colors and create a stunning display rather then everything matching so closely!! She looks gorgeous with that stunning bouquets! very pretty.